If you have decided to explore the world of home brewing one of the first and most important things you’re going to need is a heat source to boil your wort. If you’re working with small amounts, say a half gallon at a time, a stove top should suffice. But if you’re like most home brewers and you have your sights set on brewing 5 gallons or more at a time you’re going to need a burner. There are many different brands out there but whichever one you settle on it should be able to bring your wort to a boil in 15 minutes or less. The Blichmann Hellfire has a solid reputation for being among the best propane burners around and below we put it to the test. 3 Is the Blichmann Hellfire Burner Worth Buying? The first thing you’ll notice about the Blichmann Hellfire Burner is its compact size. It doesn’t look like much but as they say, never judge a book by its cover. This puppy offers 2 different heating modes: high power (140,000 BTU) and high efficiency (80,000 BTUs). Which means you’re able to control both your boil and your fuel consumption. The retaining bars of the Hellfire Burner are adjustable and will accommodate very large vats (although for practical and safety purposes you’ll likely want to draw the line at 20 gallons). While the heat shield ensures your flame doesn’t get blown out when you’re boiling outdoors in breezy conditions. When high power mode is engaged, the Blichmann Burner will bring your 5 gallons of wort to a boil in 12 to 13 minutes. Be aware though if you decide to power it with natural gas instead of propane, you can expect to spend an extra 3 or 4 minutes waiting for the boil. The Blichmann Hellfire is fashioned from heavy-duty, high-quality stainless steel and won’t be affected by damp conditions. We found it quiet, reliable, fast and – with its dual power modes – energy efficient as well. You’re going to pay more for the Blichmann Hellfire Burner than you will for some others but not so much that it’s a deal breaker. Dual power modes provide better than average control. Even in efficiency mode, it’s more powerful than most competitors. Robust stainless steel construction of the base unit. We have one quibble with the Hellfire Burner, and it’s this: as constituted it sits too low to the ground to be practical. In which case you’re going to need the optional leg extensions. No problem, right? Well, yes and no. When you actually install the leg extensions, the Blichmann Burner is lifted to a much more comfortable position, and that’s great. But what you gain in height you lose to some degree in stability. When you’ve got a full pot boiling with the leg extensions in place the Blichmann floor burner can feel a bit unwieldy. You’ll probably want the leg extensions. Is the Blichmann Hellfire Burner Worth Buying? 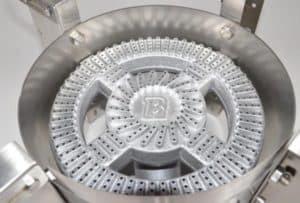 Without a doubt, if you are serious about home brewing you need to give serious consideration to the Blichmann Hellfire Burner. We went into this Blichmann Hellfire review with our skeptic hats on, but there is no denying the remarkably fast, effective performance and the high quality of the materials used in the construction of the unit. The high-efficiency mode is a big plus that allows more control while tipping its cap to environmental concerns about resource waste. 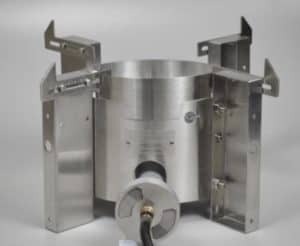 The bottom line is that the Blichmann floor burner is a burner for those who are willing to go the extra mile to ensure the quality of their finished product. 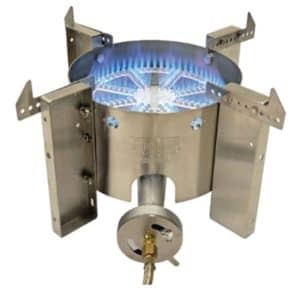 The Blichmann Floor Standing Burner is more affordable than you think and will save you loads of time and hassle as you embark on, or upgrade your home brewing odyssey.